When Jeremy Strick arrived at UC Santa Cruz, its Art History Department was tiny. Santa Cruz itself seemed far removed from any viable art scene. Strick had to travel 75 miles to San Francisco to visit a world-class art museum. But that small department, with its strong emphasis on student independence and creativity, was fertile ground for Strick, who went on to pursue a distinguished career overseeing prestigious collections of modern and contemporary art, including the directorship of the Museum of Contemporary Art (MOCA) in downtown Los Angeles. He has also been a curator at the National Gallery and the Art Institute of Chicago. Strick has been the director of the Nasher Sculpture Center in Dallas since 2009, overseeing exhibitions featuring the work of Diana Al-Hadid, Melvin Edwards, Roni Horn, and many others. He credits his UC Santa Cruz art mentors with giving him the confidence and the critical sense he needed to find his way in the art world. “The faculty was terrific, but beyond that, you had to almost create your own program,” Strick said. 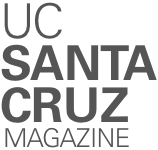 At the time he enrolled, UC Santa Cruz, which opened its doors to students in 1965, was still new. The intimate program gave him a chance to forge connections with faculty, while the interdisciplinary teachings taught him to look at a piece of art from a fresh perspective. “It was a new model for public higher education with a kind of openness and experimentation,” Strick said. Strick met his wife, Wendy (Cowell ’78, history), at Cowell College during his first day of sophomore year. He also made connections with lifelong mentors, including the late Nan Rosenthal, the first professor of art history at UC Santa Cruz. Harry Berger Jr., now a professor emeritus in the Humanities and Arts divisions, had an enormous influence on Strick’s studies, as well. After graduating from UC Santa Cruz, Strick went on to study art history at Harvard. He credits the education he received at UC Santa Cruz with giving him the intellectual tools he needed in graduate school and in his career.